Axis One is designed from the ground up to perform reliably and consistently under demanding circumstances, with maximum stability and rock-solid performance. Through careful selection of components and extensive rigorous testing, it has been optimized to match the needs of sound engineers using Waves software applications. With its rugged rack-mountable case, Axis One is designed to help any engineer deliver world-class sound reliably, anywhere, anytime. 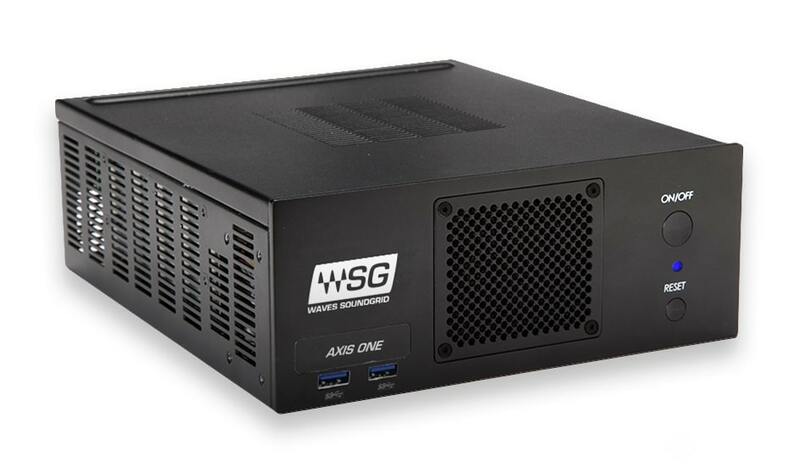 With its SoundGrid connectivity, Axis One can act as the “brain” of a SoundGrid system, seamlessly interfacing with SoundGrid I/O devices and servers. Use it at front-of-house, at monitor position, or in your broadcast AV rack – or add it to your studio for tracking, mixing and mastering. It’s highly advised to avoid having an active Wi-Fi connection during a show. Make sure you switch Wi-Fi off during performances. In order to connect Axis One to Wi-Fi, plug it into a Wi-Fi router via the Ethernet port, or use a USB-Wi-Fi dongle. Axis One comes pre-installed with Windows 10. Axis One comes pre-installed with Waves Central v10, eMotion LV1 v10, and all Waves v10 plugins. (Please note that in order to activate and use any of the pre-installed plugins, you would need to purchase their licenses). All Waves software updates, software installation and licensing are managed by Waves Central. (Please note that this applies only to Waves software updates, not to updates of any other software on the computer). Waves Instruments sample libraries are not pre-installed. Windows security updates are deployed monthly by Microsoft and are required for keeping a secure system. An update installtion can be delayed by the user up to 30 days from its deployment. Other Windows updates are disabled by default. Axis One is covered under a 1-year warranty. Opening the Axis One casing or modifying the hardware in any way will void warranty. Axis One features USB2, USB3 and USB-C ports. USB to Ethernet adapters are not supported. Axis One supports up to 3 displays using the built-in HDMI and DisplayPort ports. Using display adapters is not supported. Using a rack-shelf (sold separately) that allows mounting two Axis One units side by side, or an Axis One and a type-C SoundGrid server side by side. MultiRack v9 is supported with Waves v10 plugins only. It is not pre-installed. Tracks Live is not officially supported with Axis one. SoundGrid Studio v9 is not officially supported with Axis One. Third-party audio interfaces were not tested and are not officially supported with Axis One. 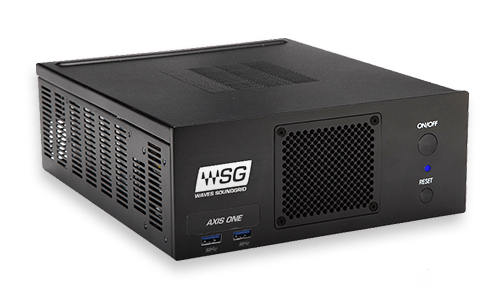 Axis One only supports SoundGrid I/O devices qualified for use with eMotion LV1.